Some organisations engage directly with schools, whereas others work outside of schools but might rely on them for support and resources. In either case, teachers and school principals are very important allies for most organisations. Girls who have access to formal education spend much of their time at school, so teachers have a huge influence in their lives. Principals and teachers often have access to resources such as fields to play on, sport materials, and transportation that could be useful for your programme and to which you may not have access. Whether your programme works directly in schools or not, creating partnerships with school principals and teachers is a good way to build support for your programme and gain access to resources. Additionally, teachers often have a much-respected position in the community, and if your programme has their support and approval, it may influence other community stakeholders’ opinions. Some teachers are generally overworked and are unwilling to take on further responsibility to practically support the development or running of sport programmes. If teachers do not have correct information about sport or life skills, then they can pass incorrect information to girls. Teachers might fear that girls attending an outside programme might take away some of their own authority as a teacher. Try to schedule practices, games, and sessions at times that do not conflict with girls’ school duties. Select a teacher in every relevant school in the community as a point person for your programme. This teacher can serve as a resource for the girls and an ally to your programme and can inform other teachers about the programme. Consider training teachers as coaches. If you do not have enough coaches, it is wise to train teachers as coaches and then they can also deliver sport to girls. If girls are uncomfortable with a certain teacher who they feel is not respecting them, discuss this with principal. Keep school personnel informed about girls’ progress in both sport and life skills. Invite them to participate in events and/or share in athletic victories. Share your curriculum with teachers, so they are clear what girls are learning at your programme. Host community meetings at schools and ask teachers and principals to be part of the programme. At minimum, explore ways in which curricula might be merged or complement each other. Sadili Oval delivers sport to girls in schools around Kibera in Nairobi through their Girl Power Clubs. At every school they ask the girls to select a ‘patron’ for the programme, a teacher who is then the point person for the Girl Power Club at the school. These patrons help build a relationship between Sadili Oval coaches and the school and serve as an important resource for the girls. At Kembatta Mentti Gezzima teachers are essential to the programme because parents trust the teachers of their daughters, and, therefore, if the teachers support the girls playing sport, then the parents will. PE teachers are recruited as coaches and referees and are very involved in the programme delivery. At Right to Play they are training teachers to facilitate sport curricula with young girls. The teachers have found that their students are more engaged and energetic during class time as a result of the sport sessions, and they are encouraging fellow teachers to attend Right to Play trainings. 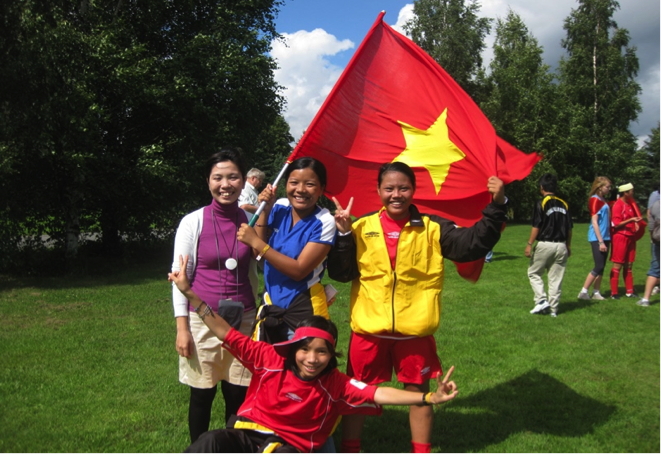 Football for All Vietnam (FFAV) trains local female teachers as coaches and referees for the local leagues. One example is a 27-year-old teacher named Ms Phan Thi Tuyen at a primary school in Huong Tra district in Hue Province. Before joining, she was shy and not confident as a teacher, but once she became involved with FFAV, she became confident, independent, and active. She was then chosen to the lead and supervise the FFAV team participating in the Norway Cup in 2010, in Oslo, Norway. She was then recruited as a club developer and eventually became a facilitator for football basic coaches. Caption: Ms Phan Thi Tuyen with students.